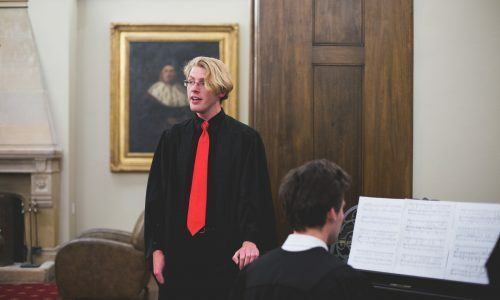 Congratulations to postgrad, Patrick Baker on the premiere of his composition, Aries, at the Conservatorium of Music. Patrick is currently studying a Master of Music Studies (Composition) under Carl Vine at the Sydney Conservatorium of Music. Previously, he completed a Bachelor of Music (Performance – Classical Voice) at the ANU School of Music studying under Christina Wilson and Alan Hicks. “By taking the spectral analyses of the four main stars of the constellation Aries (Hamal, Sheratan, Mesarthim, and 41 Arietis) and mapping them to a pitch graph, this composition aims to produce an acoustic representation of the constellation. Because of the large amount of material within the spectra, only the 12 largest peaks from each star’s spectrum were used as pitch material (this number, whilst somewhat arbitrarily chosen, may have been influenced by there being 12 signs in the zodiac). Aries was written for pianist Antonio Fernandez as part of the Zodiac Project. “My aim as a composer is to write music that people want to perform whilst staying true to my artistic vision,” said Patrick.